One of our fantastic volunteers, Jenny, has been working on listing and sorting the zine collection. In this blog post, she reveals some of the unique zines held within the archive. Glasgow Women’s Library has a small but growing collection of zines dating from the early 90’s to present day publications. 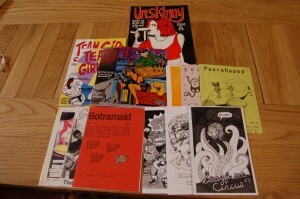 Zines (or ‘fanzines’) are small-scale self-published works. Anyone with an idea, some imagination and a photocopier can create a zine to be shared, traded or sold. The genre overlaps with comics, graphic novels and art books, but is characterised by its pervasive do-it-yourself ethos. Whilst zines have existed since the 1930s, with hand-printed science fiction fanzines, it was the 1970s punk scene where handmade and photocopied zine culture, free from mainstream censorship, began to thrive. Traditionally a male-dominated medium, the 90’s Riot Grrrl movement saw a huge increase in young women creating zines exploring feminism, politics and their own lives. A sample from Glasgow Women's Library zine collection. These grass-roots publications cover a vast array of topics; from politics, comics, culture and literature to more intensely personal, journal-like creations. For some, zines are a way of seeking change and exploring different forms of oppression. Many of our zines and comics offer representations of queer women, making humorous and insightful observations about lesbian and queer life between the 1980s and the present day. Other zines attempt to address problems in mainstream media, such as the 1990’s zine Girlfrenzy, which offers an alternative to women’s magazines. Created between 2001 and 2003, the home-grown No I’m a Veronica, named after a line from black comedy Heathers is created by three young women in Glasgow and describes itself as a “feminist, left zine about music, politics, living, doing stuff and the world”. 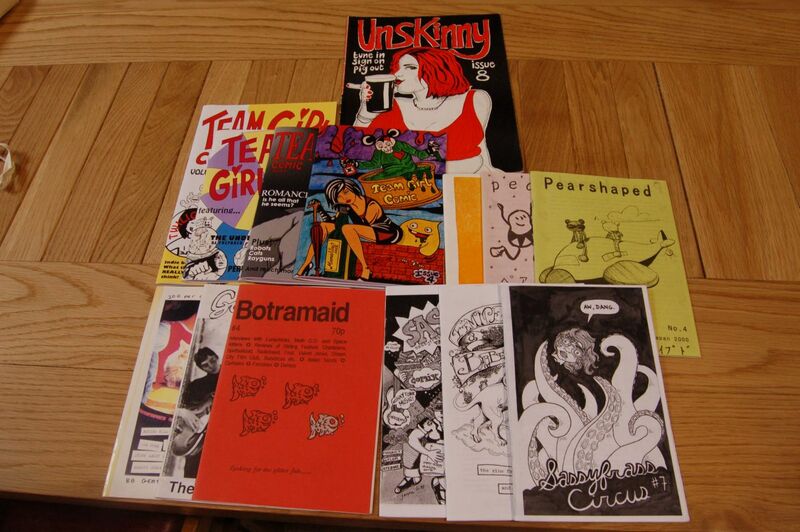 Recent Scottish publications, such as alternative teen comic Team Girl, an all-female comic collective, shows a thriving zine culture that endures despite the easy availability of online publishing. Glasgow-based zine-maker Heather Middleton will give an illustrated talk on the history of graphic novels and zines by women on the 16th May. You can find out more information and book onto the event by following this link. 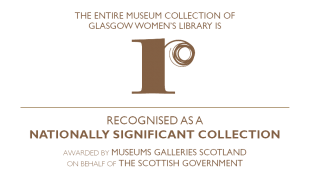 This entry was posted in Archive Item of the Month, The Collection blog. Hello there,I recently made a zine dedicated to Frida Kahlo,can I add it to your collection? Thank you! We replied to Facebook and thank you so much again!